EMP is a 501c3 non-profit corporation established in 1999 to serve as an umbrella corporation for Perinton ministries and also to serve as an incubator for new and growing ministries/services. EMP is comprised of 13 member churches, each of which appoints a director. The EMP Board of Directors serves the both the ministries and churches by providing oversight and two-way communication between member churches and the ministries. Stop the Stigma ROC (STS) is an organization that seeks to promote suicide prevention and raise awareness about mental health, specifically in youth (ages 10-25). As a youth-led organization we hope to do this through education and by providing a forum for open conversation and dialog. We feel the best way to prevent suicide is to reduce the stigma surrounding mental illness. Through conversation barriers are lessened between persons struggling with suicidal thoughts and needed professional help. We hope to connect those who need help with those who are able to provide help. The STS organization volunteers will not offer counseling services. In all cases for counseling we will refer any and all individuals to trained mental health professionals. 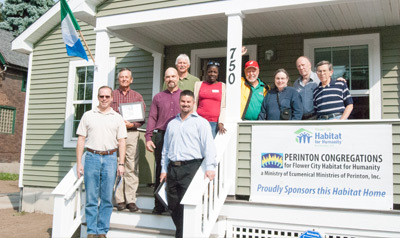 Perinton Congregations for Flower City Habitat for Humanity is one of several faith-based groups in Monroe County that raises funds and recruits volunteers to build homes for Flower City Habitat, a nondenominational Christian housing ministry welcoming people of all faiths or no faith to help eliminate substandard and poverty housing in Rochester. Since its founding in 1984, Flower City Habitat has built or renovated more than 200 houses, and is one of the largest affiliates of Habitat for Humanity International in the northeastern United States. Perinton congregations have combined to build 6 houses to date. We are a small group of volunteers who have brought the Light of Christ into the darkness of some New York State correctional facilities through Residents Encounter Christ (REC) retreats. There are far many more volunteers who make RECs happen. It is our hope and prayer that our modest project will be of service to those who serve like we have. Our primary mission is to provide monetary support to REC teams providing retreats in five upstate New York correctional facilities: Attica, Auburn, Groveland, Livingston, and Wende. Fairport Good Neighbor Fund offers the clergy of the area churches a single source to which they can refer people who are financially in need, as they might be during a personal or family emergency. Contact the clergy of a participating church for more information. Copyright © 2019, PEM-EMP. Theme by Devsaran.